what blog articles resonated the most with you, my readers! 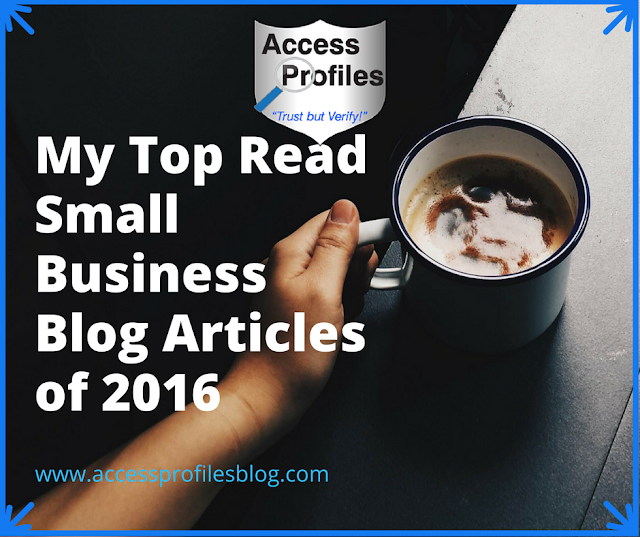 Last year I wrote about a wide range of subjects, but all were focused on you and your small business. There is no wonder then that most of my top articles center around hiring and background checks. Those two topics effect anyone who owns a small business and is thinking about taking on even one employee. 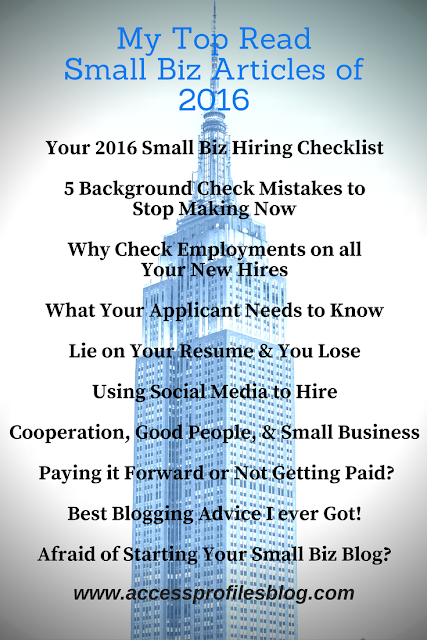 Of those articles, “Your 2016 Small Business Hiring Checklist ~ What You Need to Do Now” got the most traction. Here I shared 8 tips that covered everything from developing a hiring strategy and attracting top talent, to how to hire a good screening company. And these tips are just as relevant in 2017! My next top article looked a little more at employment background checks. When it comes to these checks, employers can realize their value but still be making some costly mistakes. Not following legal guidelines or not using employment screenings to their full potential top the list. 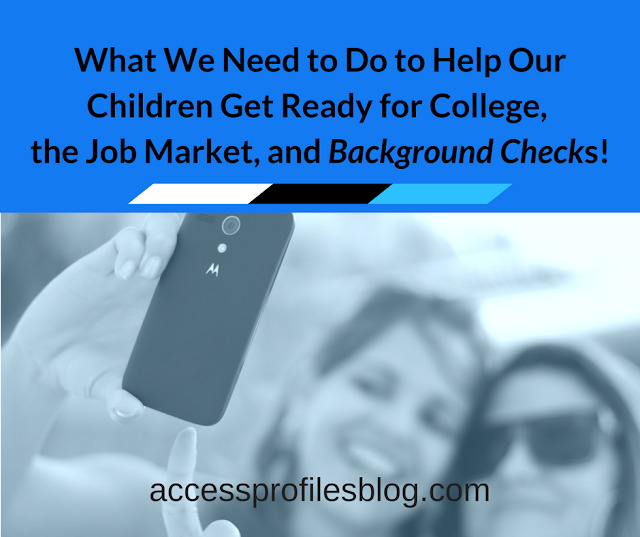 To help, I shared the Top 5 Background Check mistakes you may be making, and what you can do to get on the right track. 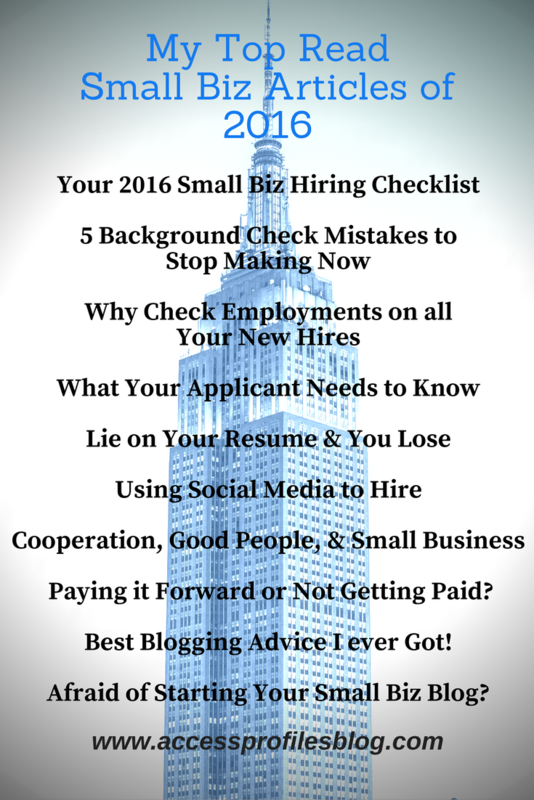 Find them in “5 Background Check Mistakes You Need to Stop Making Now”! Another top hiring article was “Why You Should Check Employments on all Your New Hires”. When people hear the phrase “background check”, they most often think of the criminal check first. However, there are other parts of a good screening that are just as important! In this article, I shared the valuable information that can be gained from checking with the companies where your applicant has already worked. The key is to know HOW to Ask the Right Questions! Find out more here! In the first, I shared what information you, as an employer, should make sure your applicants know. Being open and up front about the entire hiring and background check process helps relieve your applicant’s stress and start off your employer / employee relationship on the right foot! Find out more in “Ready to Hire? What Your Applicant Needs to Know!”. 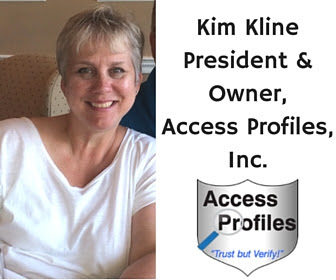 The second concerns resume lies ~ one of the top reasons employers use background checks during the hiring process in the first place. It is also a reason for not hiring an applicant if one is found! In “Employers Share ~ Lie on Your Resume and You Lose”, I list the top 5 resume lies that will keep someone from getting hired and what a smart job seeker will do instead! In the last of these 3 articles, “How Companies are Really Using Social Media to Hire”, I focused on what employers are looking for and why when they check out their applicants online! What surprised many was that employers are really checking online to confirm that their top pick is really the right person for the job! That includes verifying job qualifications and whether their applicant is projecting a professional online image. In another of my most read articles, “What Storm Jonas can Teach You about Cooperation, Good People, and Small Business!”, I discussed why it is important for small business owners to act as a “community” to help each other succeed. And keeping our sense of humor along the way doesn’t hurt either! Despite the importance of helping others, there are times when it becomes “more than just lending a helping hand”. This is when we need to remember to take care of ourselves and recognize the value of our time and knowledge. That is why I believe that “Are You Paying it Forward or Just not Getting Paid?” resonated with so many. In this article I shared 3 steps to help you “Pay it Forward” without being made to feel that you are being taken advantage of. My top most popular article was all about blogging for your small business! In “Do You Want to Know the Best Blogging advice I Ever Got?” I shared the tips that have truly spoken to me and helped me to transform my own blog. The key has been to really find my “voice” and make sure my blog is a good reflection of my brand! My final Top Read Article of 2016 also dealt with blogging. In “Are You Afraid of Starting Your Small Business Blog?”, I took a look at the fears that keep so many of you from starting a blog about your own small business. I also share why blogging has been so great for my company and some easy steps so you can get started too! if you have questions or need a blogging plan! Top Read Blog Articles of 2016! 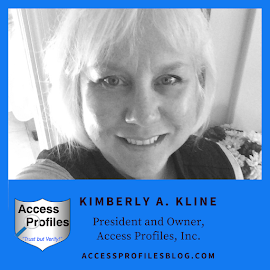 I hope to continue sharing topics and insights that will help you with your Small Business. If you have anything you would like me to cover in the coming year, let me know! I want 2017 to be great for Small Business. all about Small Business tips and news!